This week is Education Week in Newfoundland and Labrador. A time to celebrate education, teachers, schools and students. We are all partners in education – what I get from my students inspires and encourages me to try to be a stronger and more engaged teacher. We both – students and teacher – learn from each other and hope that the lessons we teach are positive and lifelong. Students today have issues that I never had when I was in school. I’ve been asked about bullying and have to admit that so much of it takes place outside of the physical building and on the internet. Students no longer have control of who has their image – the number of cameras around them is amazing and every good and bad movement of theirs can be recorded. So many of our students work – for as many different reasons as there are students – and their time is very scheduled and their schedules very demanding. Access to everything – good, bad and ugly – is easier and students battle so many demons as they go through the day. Teachers have issues that are new versions of old issues as well as completely new issues. Technology presents new opportunities for learning and teaching – if you have it and have time and support to learn how to utilize it. The same camera issues impact teachers – we don’t know who is recording us. We have policies to follow, curriculum to develop and committees to join. We are accessible 24/7. It’s a new version of the educational world. Yet, we keep on keeping on. With all the challenges out there, we all continue to persevere and build on our strengths. We all meet our challenges and find ways to work with them. Students and teachers work together and make choices to enhance the lives of both. I cannot teach without students – not just because they fill the room, but because they fill my mind with ideas and my plan book with goals. I always hope I am giving them an education that no one can take away. Sometimes it might be a lesson from a novel, sometimes it might be how to approach a question – either on a test or an application. Sometimes it might be that it’s ok to be yourself. Sometimes it might be that you’re not always right. These are lessons I try to teach while I teach methods of development, theme and other literary terms and analysis. School is for so much more than novels and math and reasons behind historical events. It’s for learning how to time manage. It’s for learning how to approach situations and do your best. It’s for learning time and place and appropriate and inappropriate. It’s for being social. It’s for learning when not to be social. It’s for learning who you are and the role you play in your world and the world of others. Once you know these things, no one can take it from you. 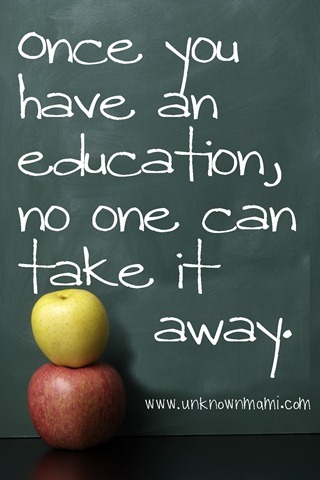 Once you have that education, no one can take it away. Teachers and students partner in this education and I have to say, there are days I learn as much from them as they learn from me. Maybe more. So, for this education week, I want to say thank you to my partners. It’s a great partnership and I appreciate you all. Happy Education Week! This entry was posted in general notes, school and tagged education week, school. Bookmark the permalink.